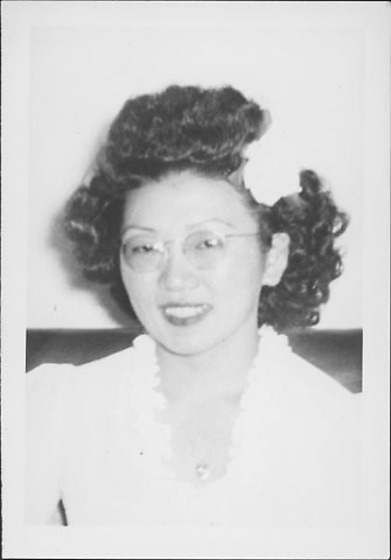 Head and shoulder portrait of a smiling woman in eyeglasses, white blouse and a white flower in her hair at Rohwer concentration camp, Rohwer, Arkansas, October 29, 1944. Woman's blouse has a ruffled v-neck collar. She wears a heart-shaped pendant and rimless eyeglasses; the white flower sits abover her proper L ear in her tightly curled hair. Back of dark upholstered chair visible above her shoulders in background. Same woman and location in 97.292.7C.